The topography, terrain, physical features and changing climate of the Hindu Kush Himalayas also make this region inherently unstable and prone to hazards. 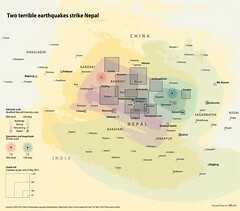 These include earthquakes, landslides, floods, droughts and other natural disasters. Steep slopes, prolonged or intense periods of heavy rainfall and unstable bedrock all promote the conditions for such hazards. Human activities that cause soil erosion and decrease the retention of water, such as deforestation, can further increase the risk of landslides and slope failure. The Hindu Kush Himalayas are also one of the youngest and most geologically unstable mountain ranges in the world. 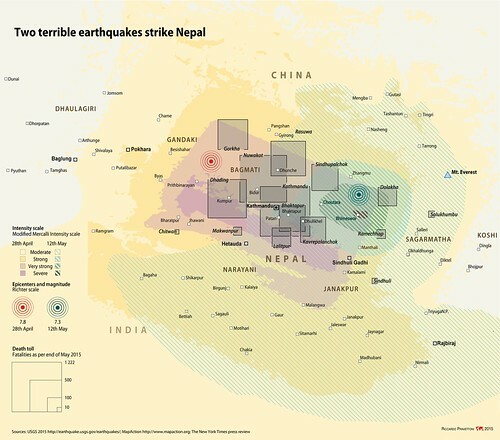 The collision of the Indian and Eurasian tectonic plates – which created the towering Himalayan mountains – is ongoing and makes this region highly vulnerable to earthquakes. The steep slopes and ridges amplify the intensity of seismic waves resulting in increased damage. The 2015 earthquake that hit Nepal killed over 8,900 people, injured a further 22,000 people, damaged or destroyed around 900,000 buildings including homes, cultural sites and schools, and displaced millions.